Photo of an AH-56A Cheyenne (Google) Note bulged canopy. As mentioned below (see the first Cheyenne I built at the bottom of this page), for years after I finished the Aurora model of the Cheyenne, I thought about building it again, particularly in more recent years. I believed my model building skills have improved since the Cheyenne I built in 1984, and over the years, I bought each Aurora Cheyenne I found, usually on eBay. I also bought two other kits of the Cheyenne, an Eastern European limited-run injection-molded kit by MIKU, and most recently, a resin kit by an Asian company called Anagrand. But the real trigger for starting this Cheyenne 2.0 was the purchase a couple of years ago of a book, War Tech Series Vol. 27 on the AH-56A Cheyenne. This book had 100 pages of photos, drawings and text, detailing the whole ill-fated Cheyenne project. By this time, I had five Aurora Cheyenne kits, plus the MIKU and Anagrand kits. I began to think about how to visit this model subject again, 33 years after building Cheyenne 1.0 (Beta). So in May of 2017, I began Cheyenne 2.0. One of the real challenges for Cheyenne 2.0 was could I improve on the shape of the canopy? 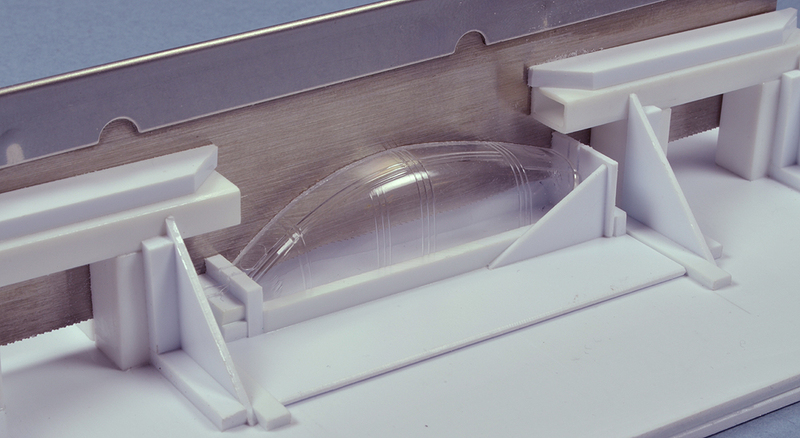 In the Aurora kit, limitations on economical injection-molding possibilities resulted in a simple cross section through the canopy: a parabolic shape, wider at the base and narrower towards the top, that could pop out of the mold easily. The real Cheyennes had a bulged canopy that was wider in cross section towards the top, and narrower where the canopy attached to the fuselage, as you can see in the image above. The rather disorganized-looking sequence of images and text below document the progress of the build, in more or less chronological order. I tended to tackle the most challenging steps first; for example, if making and installing the modified canopy didn't work out, there wasn't much point in doing any subsequent work. The demanding assembly and detailing of the main rotor was the next challenge: lots of fussy bits of brass and aluminum tube and wire. Scratchbuilding/modifying the wings and tail surfaces followed, and once those were headed in the right direction, making the many smaller-but-easier details came next: landing gear struts, gun turrets, sensor turret, other rotors, and various surface details. 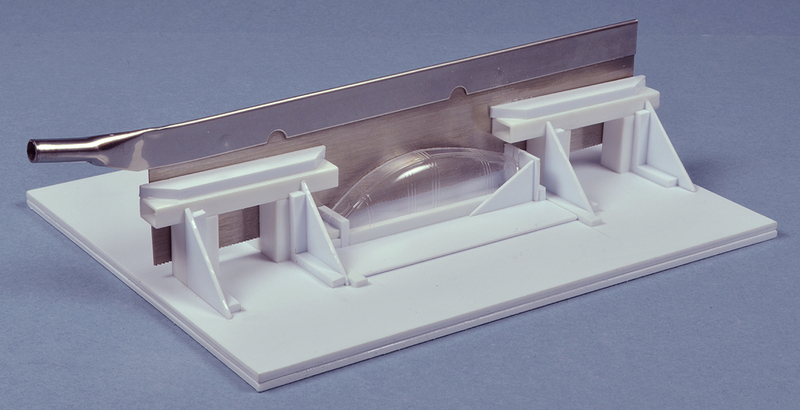 With all of my model projects, I believe that having accurate drawings is essential to building an accurate model. The more conversion or scratchbuilding required, the more essential the drawings become. I found these Lockheed drawings of the Cheyenne on the internet. Later, I found a CD for sale on eBay with PDFs of Lockheed Technical Manuals that contained the same drawings. I used a plotter with variable enlargement to print these drawings at 1/72 scale, and these became my guide for building and scratchbuilding the Cheyenne 2.0. Drawings by Lockheed, taken from Google. Aurora Cheyenne canopies, from left to right: Whole kit canopy; two kit canopies cut into three pieces, another whole kit canopy. As you can see in the picture above, the shape of the Aurora kit canopy (seen at the left and right in the picture) was widest at the base where it attached to the fuselage. What I decided might work was to extravagantly slice up two Aurora Cheyenne canopies and cobble them together into one, bulged canopy. My results on surgery on canopies for the Charger II scratchbuild (CLICK here to see it) made me think this might succeed. The goal was to cut the canopies so that each piece to be used had about 10 or 15% more material at the site of the future joint. The left side had 15% more toward the center, the center piece had 10% more to both the left and right, and the right side also had 15% more toward the center. Once the edges were carefully cleaned up and the three pieces were glued together, all the extra material should cause the finished canopy to bulge outward near the top. First attempt at a three piece bulged canopy temporarily taped to spare fuselage and sanded to smooth seams at canopy. Unfortunately, there was a long learning curve for this process, and the first attempt started out OK, but as I worked on the canopy, problems developed in the sanding and polishing steps. The forces applied to clean up the two joints caused gaps to keep opening at the seams. Eventually, this first canopy attempt had been repaired and reglued so many times that by the end, as I was manipulating the canopy and fuselage to fit together, the canopy just fell apart. I didn't think it was worthwhile to try to reglue it together again, so I started over. Good thing I had quite a collection of Aurora Cheyennes available. Long shot of canopy cutting jig. The intent of the jig was to guide the long, stiff razor saw (no wobbling here) in as straight a cut as the jig could manage. A styrene holder was fashioned to firmly secure the canopies in place while I was sawing. The holder was fabricated to slide from side to side very precisely and at a right angle to the guide for the saw blade. Once the canopy in its holder was exactly under the saw blade in the desired location, the holder was fixed in place with Tamiya masking tape. All in all, I think there was less than .25mm of play in the sawing jig. This allowed me to make my cuts very precisely. The resulting clean, straight and precise cuts allowed for two much stronger glue joints between the three canopy pieces. Closeup of canopy cutting jig. I started building the cockpit at the same time I tried to make the first bulged canopy, so that I could test fit the cockpit and canopy together. I only took the cockpit as far as necessary for that coordination, but once the first canopy attempt failed, I had to start the second canopy and that meant I had to modify the cockpit to fit. I had added vertical 20 thou by 20 thou strips of Evergreen to the interior of the Aurora kit to represent the fuselage framing. I modified the Aurora cockpit floor (several/many times). I wish I had photographed this phase, but I was too interested in making progress to stop the building to take pictures. Once the (second) canopy seemed like it was going to work out OK, I finished building the cockpit. Compared to my references, none of the three kits had useful instrument console parts, so I scratchbuilt them from Evergreen thin sheet styrene. The instrument panels themselves were some of my homemade 1/72 scale instrument film, cut to fit. I meant to daub a few tiny dots of red, green and yellow paint on the instrument panel knobs, dials and switches, but I forgot to do so before the cockpit was all installed and somewhat unreachable. Try harder next time; moving on. The MIKU kit had photoetch seat harnesses which compared very well with the War Tech images, as did the resin seats from the Anagrand kit, so I used these parts. The pilot's fixed gun sight mounting was a Squadron Shop "Tru-Details" photoetch part which also matched quite nicely the image from a CD I bought on eBay of PDFs of the Lockheed Technical Manuals for the Cheyenne. The little rectangle of acetate in the mounting is supposed to represent the reflector sight glass; I love the way this bit of acetate catches the light, when the angle is just right. The gunner's sighting systems station is from the Anagrand kit. Cockpit with mix of kit parts and scratchbuilding. Scratchbuilt consoles with AutoCAD film instrument panels. Anagrand resin seats and gunner's sighting system. 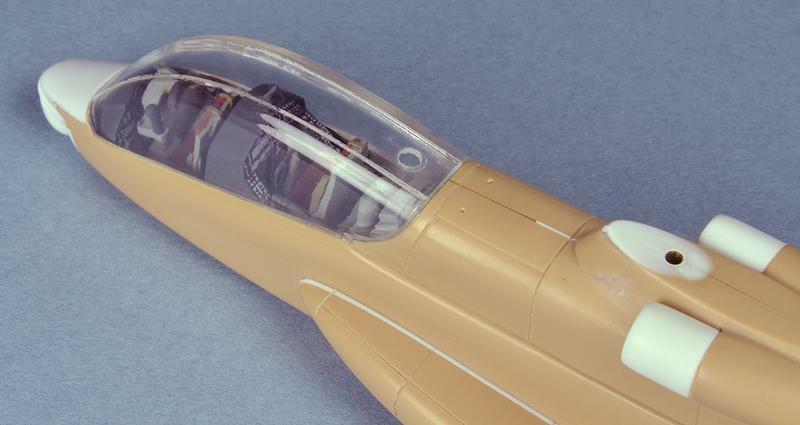 The other thing I had learned on the first canopy was to not try to sand and polish the seams on the canopy assembly, held loosely in the spare fuselage with Tamiya tape, or in my fingers. This approach placed too much stress on the fragile glue joints, causing them to partially crack open, requiring repeated re-gluings. 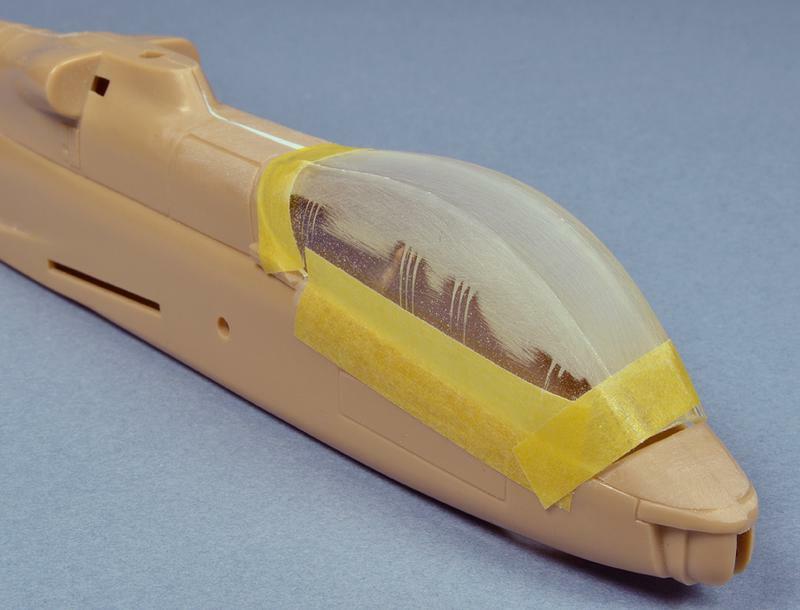 Instead, this time I glued the unsanded canopy assembly to the fuselage with Testor's liquid cement, and then faired the canopy into the fuselage with 30-minute epoxy. Before the epoxy had cured, I used 91% denatured alcohol on a folded paper towel to carefuly smooth away the excess epoxy, leaving cleanly filled gaps and creating fillets between the canopy and the fuselage. Now, when I began to sand the canopy, it was strongly supported on all of its edges. No flexing here to weaken the joints between pieces. Also, in theory, the canopy was sealed to the fuselage with glue and epoxy, so no dust or debris could get inside and be seen. Ha. Much more successful second attempt at a three piece bulged canopy installed on fuselage and polished. It is said that "No battle plan survives first contact with the enemy". My second canopy had its own problems. Sealed to the fuselage, the canopy was very stable, but I managed to sand completely through one of the seams, opening a tiny gap that let great quantities of sanding dust inside. I thought my best choice was to drill a large hole through the back top of the canopy (in an area that consists of painted metal on the real Cheyenne, where I can later plug the hole and conceal it under paint). I also drilled a smaller hole in the front underside of the fuselage, where the gunner's sensor turret will go. Through these two holes at opposite ends of the cockpit, in through the bottom hole and out through the top hole, I was able to blast air from my airbrush at high pressure, to clean out the sanding dust. As I continued to work on the model, I blocked these two openings with Tamiya tape, to keep any new debris from getting in. You can see the exit hole at the rear of the canopy in the picture below. Three piece bulged canopy installed on fuselage and polished. From looking at my reference photos, the main rotor of the Anagrand kit seemed accurate and well detailed, so I chose to use it. However, the main rotor blades were a couple of scale feet short, compared to the stated main rotor diameter in the War Tech book, so I added Evergreen styrene plastic to the rotor tips. In addition, the Anagrand kit had very useless resin parts for the rotor linkages, so I scratchbuilt them from brass and aluminum tube and wire. 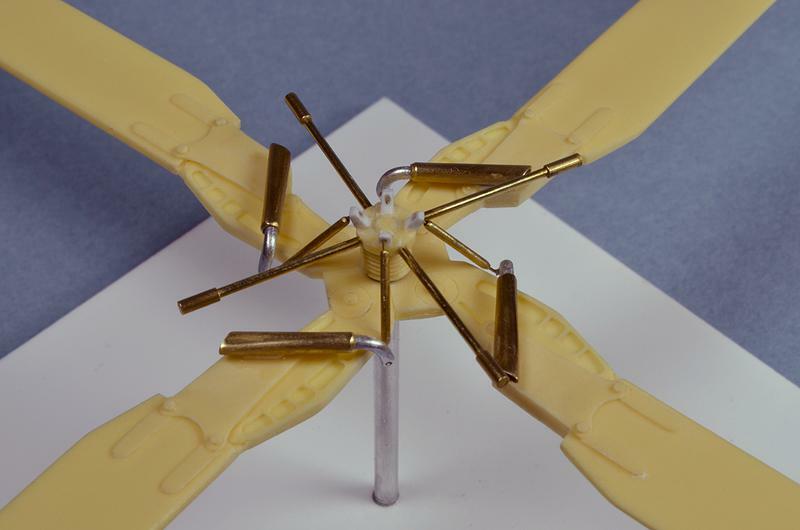 Resin rotor blades from Anagrand kit with scratchbuilt linkages made from brass and alunimum tube and wire. 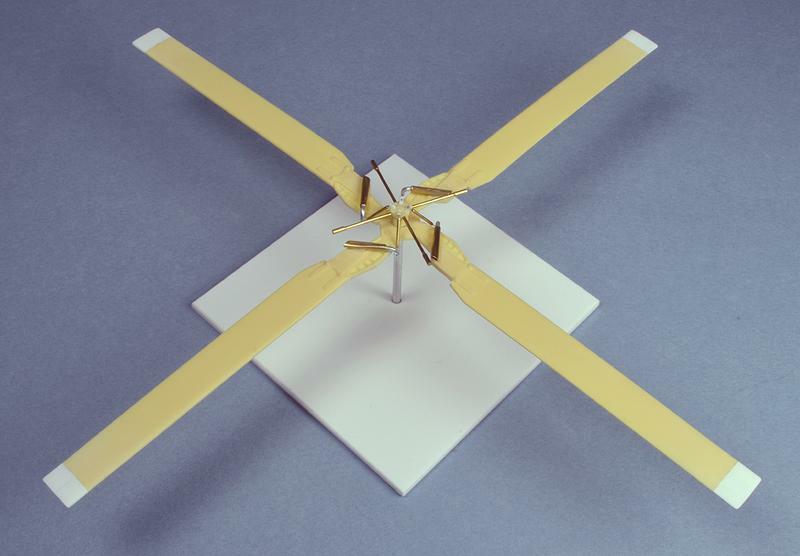 Note Evergreen white styrene plastic extensions added to resin rotor blades to achieve accurate rotor diameter. Since the air intakes from the Aurora kit seemed pretty undersized, and since the air intake scratchbuilding I did for the Charger II seemed to work pretty well, I decided to make new air intakes from Evergreen styrene tube. 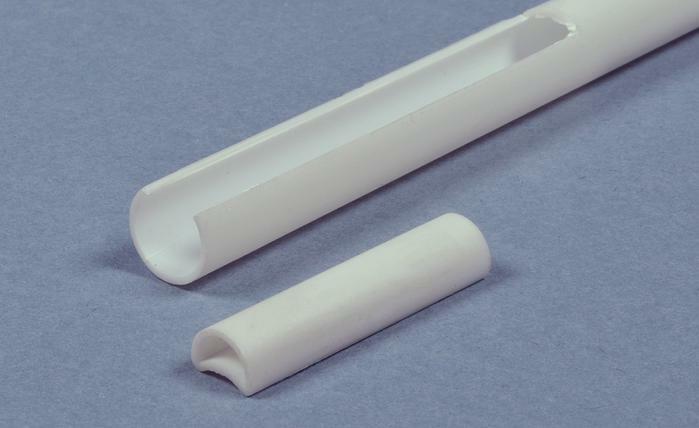 I cut a strip out of a length of tube matching the outside diameter of the intake, and glued the remaining "C" shape on to the outside of a length of a larger diameter tube. Once the cyanoacrylate had cured fully, I cut the "C" section away from the larger tube, which gave me a kind of "D" section, not too unlike the shape of the air intake. After sanding and smoothing the glued joints along the edges of the "D" section, I thinned and rounded the leading edge of my extrusion and cut to length the first of two air intakes. After repeating this process, I installed the new intakes to the Aurora fuselage. Smaller diameter partial section of tubing glued to larger diameter tubing to make air intake. Intake cut loose from tube and edges sanded. 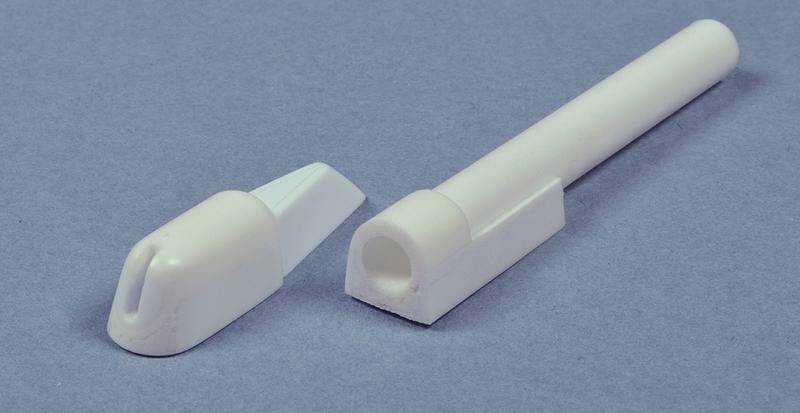 Air intakes fashioned from Evergreen styrene tube attached to the fuselage. The Aurora Cheyenne had the wings of the earliest prototypes. I wanted to model one of the later versions, which had revised wings with much more surface area. The Anagrand resin kit had these later version wings, but from my drawing references, I didn't think they weren't quite the right size and shape, so I scratchbuilt the wings from Evergreen sheet plastic, with Evergreen half-round strip at the leading edges. Fortunately, I thought the Anagrand tail surfaces had promise; they were just a little too short. I made them long enough by adding Evergreen plastic to the base ends, filing and sanding the Evergreen until it matched the airfoil shapes of the Anagrand pieces. You can see the wings and tail surfaces installed on the fuselage in the gallery below called "Dry fit of subassemblies"
To scratchbuild the turret/housing/fairing for the 30mm gun, I built up a homemade "extrusion" from Evergreen styrene plastic. The assembly of tube, rod, flat stock and triangular stock built up to a cross section that matched the shapes in my Cheyenne drawings. Cyanoacrylate glue bonded the Evergreen together and filled in all of the gaps between the pieces, like a putty, only better. 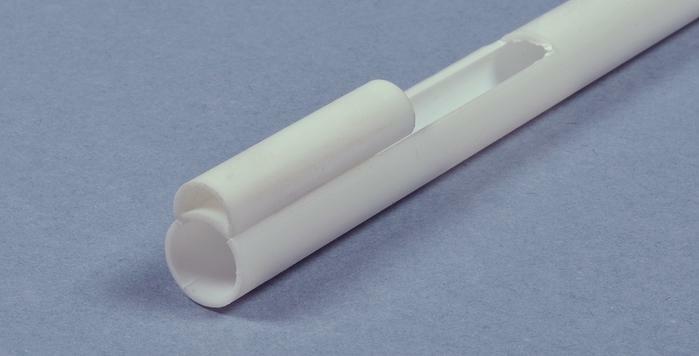 The long length of the tube in the extrusion gave me a handle with which to hold the extrusion while I shaped it. I filed and sanded the front end of the extrusion, again to conform to my drawings. Once the slot for the gun's elevation was complete, I then cut the piece free from the handle, and shaped the back end of the turret. The fairing at the rear was built up from Evergreen strip stock. 30mm gun housing: leftover built up extrusion at right, finished turret at left. The images in the gallery below depict the Cheyenne with the flying surfaces, weapons pylons, dust filter intakes and some antennae installed. You can also see how I added a significant amount of Evergreen plasti to the nose area of the Aurora kit, to make the nose and turret look more like my references. The landing gear, wheels and rotors are dry fitted to the model. Click on the thumbnails to see larger images. Sanding and polishing the canopy removed all traces of the raised scribing on the surface of the canopy that represented the metal framing of the Cheyenne canopy. To mask the canopy to keep paint off of the portions of the canopy to remain clear, I had to delineate where the framing occurred. I cut strips of Tamiya masking tape to match the widths of the metal framing and applied the strips to the canopy as best I could at the locations on the canopy that seemed to match my scale drawings. Once the canopy was masked and all of the detail parts were finished, I started painting. Despite my imprudent words in the "Opinion" section of the "Model Building" tab, pontificating on how I don't paint my models to replicate real paint on real machines fading due to exposure to the elements, on this model, I decided to mix paint to simulate the fading of paint due to exposure to the elements. Based on my references, US Army helicopters in the 1960s were painted FS 34087 Olive Drab at the factory. Apparently, once exposed to the tropical sun of Southeast Asia, this OD paint quickly faded from a slightly-brownish-but-mostly-olive-green color to a reddish-brown color. This phenomenom was so universal, many if not most photos of Vietnam War-era Hueys, Chinooks, Skycranes, and Cobras et cetera show this reddish brown color (taking into account the untrustworthiness of images made from photo negatives, printed in darkrooms, re-photographed for publication in books and magazines, printed on commercial presses, all subject to color shifts at every step of the sequence). I took Humbrol No. 155 Olive Drab and added a little Humbrol No. 60 Insignia Red. I sprayed my mix on to the plethora of spare Cheyenne fuselage segments I had left over from my building surgeries. The first mix was too red, so I added a lot more Olive Drab to bring it back to the proper (highly subjective, I know) reddish brown shade. Now I had my paint. I debated which markings to apply to the Cheyenne 2.0. There were only nine prototype Cheyennes built, and it never went into production, but I didn't want to do one of these prototypes. I wanted to imagine that this amazing helicopter did make it into mass production and deployment; hence the faded OD paint. So from my decal collection I rounded up the minimal operational markings for a deployed US Army helicopter in the early 1970s, again based on my references for AH-1 Cobras from that time. After spraying the rotors Humbrol No. 67 Panzer Grey (to approximate flat black at 1/72 scale), I masked the rotor tips and airbrushed Humbrol No. 11 Silver. This bright underfinish made airbrushing a thin but opaque coat of the Humbrol No. 154 Insignia Yellow much easier. The interiors of the landing gear doors and the wheel wells were painted with Humbrol No. 147 Matt Light Grey. All paint was Humbrol, the decals were MicroScale/SuperScale, and the final finish was Testor's Clear Flat Lacquer. Once all the painting was finished and the masks were removed, I wasn't certain all the sturm und drang of the canopy surgery was worth the effort, but in any event, the model was done. Incidentally, after doing all I could to mix and apply the custom paint, and to photograph and PhotoShop the digital images to make the appearance of the model on my Dell computer screen match the appearance of the model in my hand, once I uploaded the images to this website, the color of the model on my HP All-In-One computer is distinctly different from the color of the model on my Dell. Who knows what it looks like on YOUR computer? So it goes. Click on the thumbnail images below to see larger images. Revell Sikorsky CH-54 Tarhe "Skycrane"
The Skycrane is a subject that still needs a decent kit. To the best of my knowledge, there were/are only three plastic model kits of the Skycrane: an out-of-production 1/100 scale kit by Tamiya, a 1/72 scale kit by long-defunct Aurora, and a currently available 1/72 scale kit by Revell of Germany. In my opinion, based on studying photos of the CH-54, none of these kits are very accurate. About ten years ago, I combined the nose/cockpit of the Aurora kit with the entire rest of a Revell USA kit. 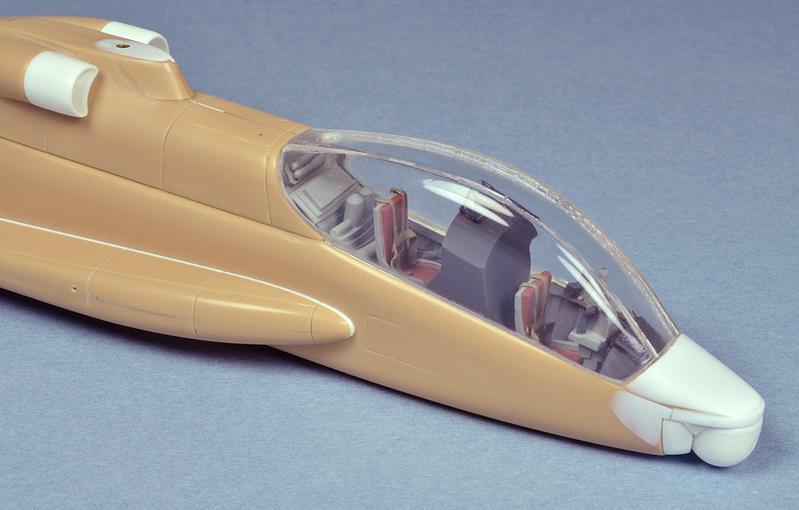 The Revell kit was spoiled by a too-flat windshield. The Aurora nose was somewhat better than the Revell, especially around the transparencies, but if you compare the photo of the model above with the photo of the real CH-54 at the top of this entry, you can see the model's nose is still poorly proportioned. I have found this is the most amazing feature of photographing models: in a photo of the model, my eye immediately spots the defects in said model that I cannot see by looking at the model itself. Live and learn. The Skycrane demands that you find some way to suggest the spaghetti-mess of cables, wires, and lines that infest the top of the fuselage, at the engines, hydraulics and pneumatics. I tried a variety of very fine, very malleable aluminum wires from a model car accessory company called Detail Master. My experience with this excellent material was very useful when I built the Atomic Cannon. 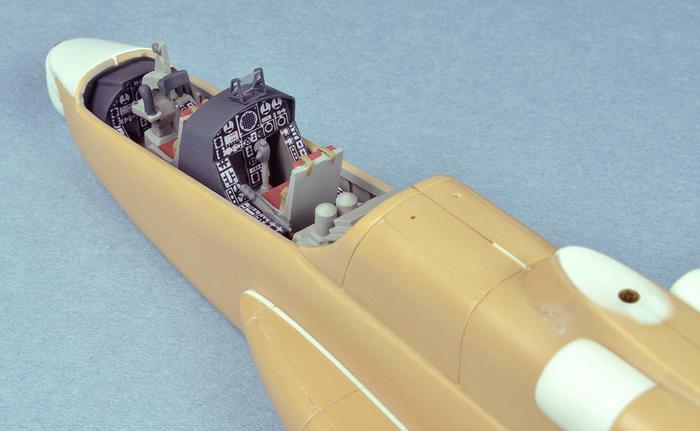 The cockpit was detailed with photo-etch seat-belts and foot pedals; the back of the instrument panel was detailed with tiny bits of Evergreen rod to simulate instrument housings, complete with wires out of each instrument. Drive shafts made of aluminum tubing were added, from the engines through the exhaust vents to the transmission. Photo-etch screens were added at cooling openings in the tail. All paint was Humbrol, decals were Revell, flat finish was PolyScale. 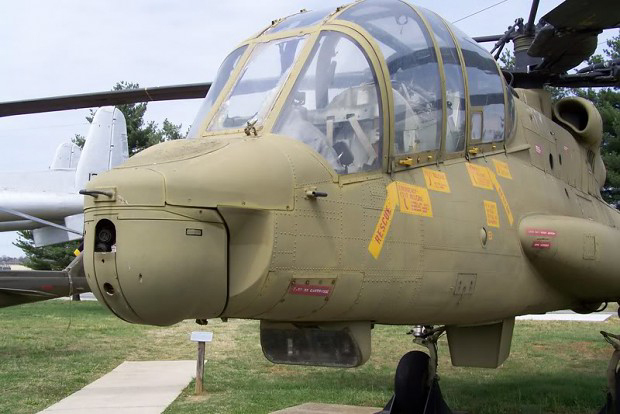 In November, 1965, Lockheed Aircraft Corporation was awarded the contract to develop the AH-56A Cheyenne attack helicopter, to become the Advanced Aerial Fire Support System for the U.S. Army. The Cheyenne was an extremely technologically-advanced concept, incorporating the latest in sensors, weapons control and engine design into a sleek, streamlined airframe. 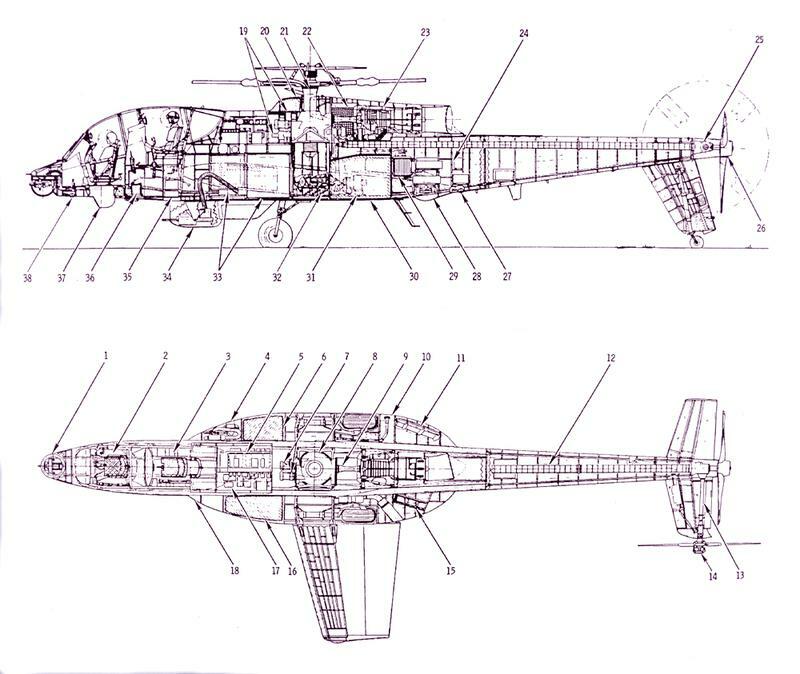 Unlike typical helicopters, the Cheyenne employed a "rigid rotor" system in the main rotor, to improve stability and efficiency, while also greatly increasing speed and agility. The Cheyenne could roll and loop like a conventional fixed wing aircraft. The gunner occupied a stabilized, swivelling front seat, sighting through advanced magnifying optics installed below his seat, aiming and targeting with a laser range finder. Wherever the gunner directed his sight, the gun turrets automatically tracked with him. The pilot, in the rear seat, could also direct the guns with a sight mounted on his helmet. Nine pre-production Cheyennes were funded, built and tested. Unfortunately, the newness of the many cutting-edge technologies, along with rising costs, conflicting program requirements and regulations, and missteps on the part of both Lockheed and the Army, led to the program being cancelled in August, 1972. However, much that was learned in the course of developing the Cheyenne proved useful in developing the Hughes AH-64A Apache attack helicopter program. I built this model sometime before 1984, as you can tell by the inclusion of a flight crew. I was very big on installing pilots, back then. What was I thinking? I also was very interested in adding moving parts, so this model had retractable landing gear, and a swivelling tail wheel. If you turned the sensors turret, under the gunner in the front seat, he swivelled with it. But best of all, at least until my feeble glue joints failed, the model had an internal assembly of cannibalized wrist watch gears that caused both rear rotors to rotate (in the correct directions) when you turned the main rotor. I thought that was pretty cool, back in the day. The inspiration for building this model came when I spotted a real Cheyenne on display at the U.S. Army Transportation Museum, at Ft. Eustis, Virginia. I picked up a paint fragment that had fallen off of the Cheyenne, which gave me the source of the FS-495a #34079 "Forest Green" finish on the model, instead of the usual #34087 Olive Drab helicopter color. That display Cheyenne has been since moved somewhere else, sometime in the 1990s. Getting much of a good result from this Aurora kit of the Cheyenne was a challenge. Long before eBay made this easy, I had to combine two expensive, incomplete, second-hand Aurora kits, to have one full set of parts. Perhaps the worst area of the kit was the main rotor and hub assembly. The kit's rendition of the complex rigid rotor design was massively too big. I replaced most of those parts with a scratch-built hub made of plastic, aluminum tubing and piano wire. I shaved down the thickness of the main rotor blades some, but not nearly enough. The pusher rotor at the very rear was scratch-built, because the kit part was a joke. The mini-gun in the front turret is an undistinguished cluster of piano wires (but it swivels and elevates), and the main gun under the crew is scratch-built, as are the trailing edge extensions of the wings. All paint was Humbrol, decals were Micro-Scale, except for the Aurora kit's yellow warning band near the tail, and the strangely shiny flat finish was Poly-S. So far, I have collected two more Aurora Cheyennes, plus an unknown Eastern European copy of the Aurora kit (that includes photo-etch details), and an Anagrand resin Cheyenne (which looks like it will be pretty good), all in the hope of building a new, better Cheyenne, someday. Click on the thumbnails below, to see the bigger images. U.S. Army Piasecki H-21 Shawnee "Flying Banana"
The Piasecki (later Vertol, later still Boeing-Vertol) H-21 Workhorse was a versatile transport helicopter powered by an air-cooled 1,425 horse power, nine cylinder Wright R-1820 radial engine, driving separate shafts to the two rotors. First flight was in April, 1952. 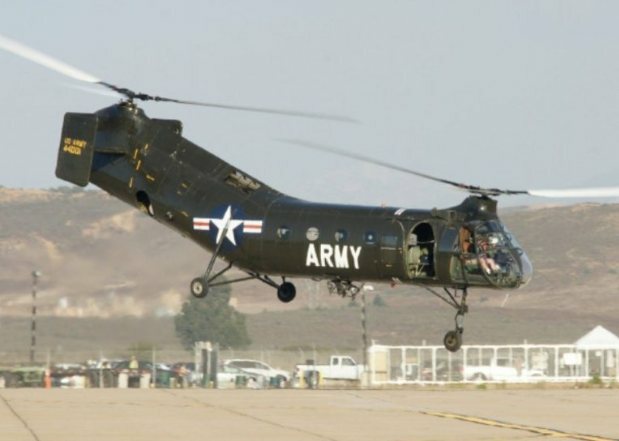 Initially ordered by the USAF, the H-21 was also operated by the U.S. Army as the CH-21. Eventually, H-21s served with the armed forces of France, West Germany, Canada, Japan, and Sweden. CH-21Cs were deployed extensively by the U.S. Army in the opening years of the Vietnam war, as troop-, assault-, and cargo-transports, and on rescue and recovery missions. Among many other duties, USAF H-21s delivered materials and supplies to the construction sites for the North American DEW-Line radar system, and performed Arctic Search and Rescue missions. Hobbycraft Piasecki CH-21C Shawnee "Flying Banana"
This Hobbycraft kit of the CH-21C was only the second plastic model kit ever made of this helicopter, preceded in the 1960s by an Aurora reboxing of a 1/48 scale model made by a long-gone company called Helicopters For Industry. I was very excited to buy and build this model, since I have been interested in the CH-21 for a long time. It was a pretty primitive kit, and I could find very little reference material to help me detail this very sparse model, until I went to the research library at the Smithsonian's National Air and Space Museum. There, I found a big, fat folder full of pictures and information about the CH-21. There were original 8 x 10 black-and-white and color photographic prints from the 1950s, drawings and sketches of the interior and exterior, and some long forgotten report, typed on onionskin paper, concerning problems with the original wooden rotor blades. 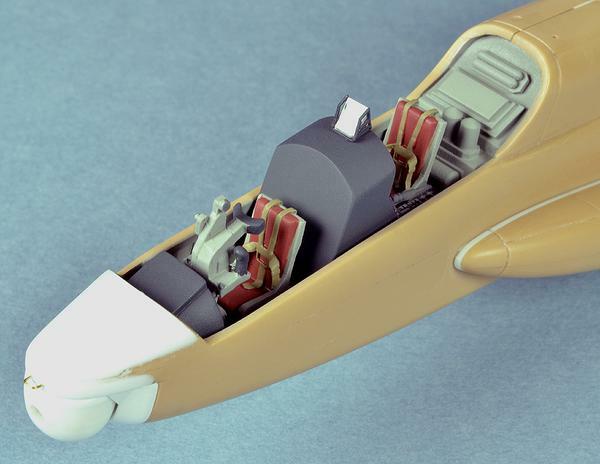 I added an Evergreen styrene plastic floor and a ceiling, along with fuselage framing, to the fuselage interior. I also added a suite of radio and electronic gear to a scratch-built equipment rack, behind the cockpit bulkhead. I installed an approximation of a radial engine, way up inside the fuselage, near the round cooling cutouts in the lower fuselage, along with an oil reservoir, engine mount, plumbing and other assorted details, all very difficult to see in the finished model. I cut out the solid, molded representation of the screened cooling openings above the engine compartment, and applied the finest nylon screening I could find, which was still pretty coarse. You can barely make out the drive shaft and couplings, through the screening. Take my word for it. I noted in a book on helicopters in Vietnam that the crews often removed both doors and the small oval windows directly opposite, to provide cross ventilation (and quick emergency exits, in case of trouble). The white stripe on the top of the fuselage was for recognition by any friendly aircraft, in the vicinity. An MV model railroad lens was added to the scratch-built searchlight, on the bottom of the fuselage; you can see that it has gone yellow with age on this twenty-year-old kit. This model received the First Place trophy for Helicopters at the 1993 IPMS National Convention in Atlanta, Georgia. Italeri has since come out with a very well detailed 1/72 kit of the Shawnee, which I own and will build, "someday." All paint was Humbrol, the decals were assorted MicroScale, and the flat finish was Poly-S. Click on the thumbnails below, to see larger images.